I’ve been drawing from life so far, but this one’s from a photo. When I got to the POL depot, there was a huge great military ship docked, crowds of vehicles, and nowhere to park. I wasn’t sure if I’d get a gun waved at me. 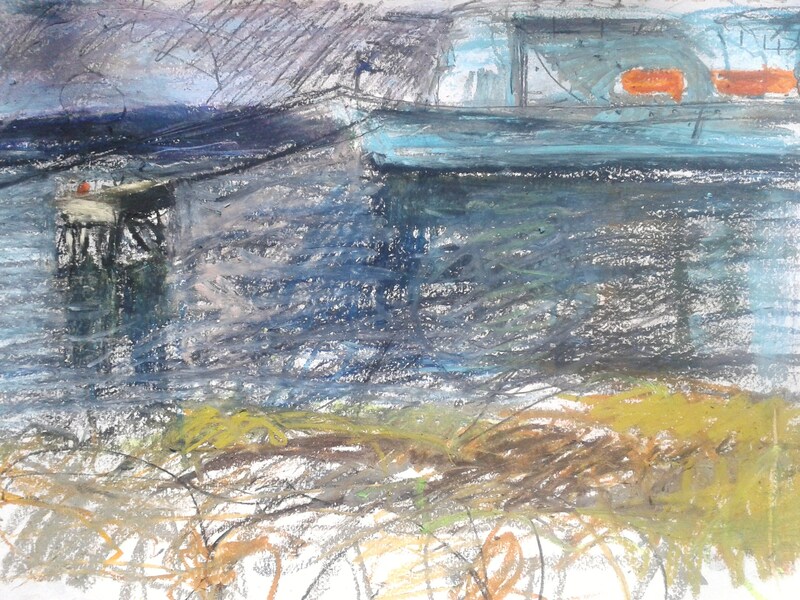 So I drove to a spot quite far down the coast and did a drawing in which the boat looks tiny and absurd – a clunky great tub in a shortbread-tin picture. On the way back, I pulled up alongside the depot, and asked a man eating a chocolate bar if I could take some photos. ‘Aye, I think so,’ he said, and shrugged. The boat was vast and towered over me – grey and neon and awesome.